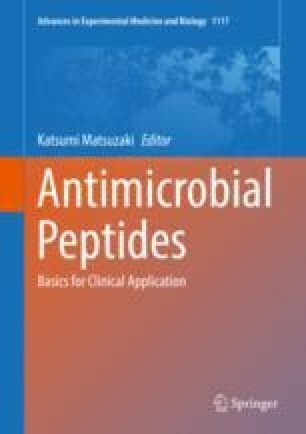 Antimicrobial peptides (AMPs) have been described as one of the most promising compounds able to address one of the main health threats of the twenty-first century that is the continuous rise of multidrug-resistant microorganisms. However, despite the clear advantages of AMPs as a new class of antimicrobials, such as broad spectrum of activity, high selectivity, low toxicity and low propensity to induce resistance, only a small fraction of AMPs reported thus far have been able to successfully complete all phases of clinical trials and become accessible to patients. This is mainly related to the low bioavailability and still somewhat expensive production of AMP along with regulatory obstacles. This chapter offers an overview of selected AMPs that are currently in the market or under clinical trials. Strategies for assisting AMP industrial translation and major regulatory difficulties associated with AMP approval for clinical evaluation will be also discussed. ClinicalTrialsPage (n.d.) https://www.nia.nih.gov/health/what-are-clinical-trials-and-studies. Accessed Jul 2018. DrugDataBase (n.d.) http://www.drugsdb.eu/index.php?l=c. Accessed Jul 2018. WebPage, P (n.d.) http://www.polyphor.com/pol7080/. Accessed Jul 2018.